I am one who is bad at sending greeting cards on time. More often than not, my friends receive birthday cards and presents from me long after their actual birthdays. And my Christmas cards only arrive in January! So I just want to quickly sneak in and wishes everyone who celebrate Easter a blessed Easter! Meanwhile, here's a sweet little something I made for OCT's colleagues this week,as a gesture of appreciation for the fantastic farewell party they threw us. (ok, his PI, Prof RK paid and hosted us, but still everyone made an effort to turn up and the company was great! 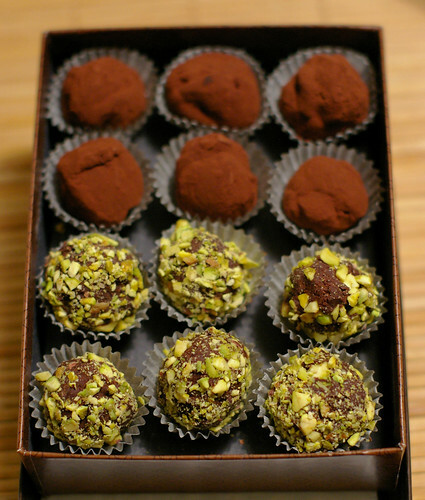 )This truffle recipe which I saved since Christmas from Warda of 64 sq ft kitchen makes a perfect edible gifts. I made them with the leftover egg yolks from another recipe and they were delicious. This truffle recipe from Chef Jacques Pepin is different from the one that I am accustomed to, in which heavy cream is used insteads of egg yolks. However, upon reading Christine's rave review after making the truffles, I know I need to try it when the right occasion arises. I ended up making 2 flavors- Irish Cream and Grand Marnier. Some modifications were adopted to utilise what I had on hand. For instant,Bailey Irish Cream was used instead of espresso because I love Bailey in everything and was simply too lazy to brew espresso at that point. I also omitted orange zest that the original recipe suggested, because guess what? I had run out of orange. On hindsight, I should have added some meyer lemon zest into it. Because the flavor of the grand marnier truffles was milder than what I like. Maybe a little more booze would help. I need to try that again later this week. I am also sending these bittersweet gifts over to Danielle of Habeas Brulee who is hosting this month's Sugar High Friday. Be sure to check back her on 28 March to read about the sweet gifts other bloggers have whipped up for the event! You can't go wrong with truffles, especially at Easter! The flower shot is just mesmerizing! Your truffles look delicious! Always love the look of pistachio's. Happy Easter! 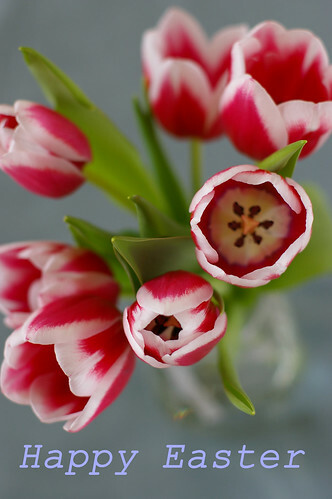 I love the tulips and the truffles! With the truffles popping up everywhere, I think I need to try. Any tips for rolling them so nicely? Happy Easter, Mandy. Your truffles look gorgeous! I'm sure that they taste as good as they look. is it wrong that i want to eat these for breakfast? because i do. i've never heard of using egg yolks in truffles - i'm intrigued, and must try this immediately. flowers look great as well as those chocolate truffles. Hiya I can't stop eating chocolate! Happy Easter for you and family. Ha! what are the chances we both post truffles today...Yours look great! and the flowers are breath-taking! Happy Spring & Easter!! ZOMG, Mandy, I made your pineapple tarts this weekend and they are sooooooo good. Thanks so much I will post it soon. These truffles look out of this world! I never made truffles in my life - maybe never dared:) The time has come I think:) You are such an inspiration! Pistachios, chocolate, bailey's...how can you go wrong. They look amazing. Beautiful! I also made truffles over the weekend for the SHF. Great minds think alike right? 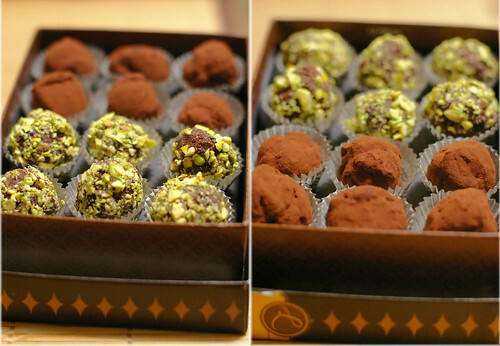 these truffles are gorgeous...especially with pistachios. Those truffles looks great, and so professional! Gorgeous! Gorgeous! Lovely truffles! Happy Easter! Love your "sweet little things"! The truffles look great, though I am loving the flowers. so lovely, how can I resist such temptation? Hello Mandy....I feel honored that you came to visit my blog ^_^..
your blog is so greeeaaatt... love all your pictures and the way you style them ^_^. Hey Mandy - Love the tulip shot and the truffles look soooooo inviting! Hope you ahd a wonderful Easter! Your photos are always a feast for the eye and your recipes enticing! These truffles look evocatively delicious! Finally found a Sabahan blogger! We are from the same state. My hometown is Sandakan but did stay in KK for some years. I like your blog and photos! These look almost too lovely to eat! But not for long! I may have to try these this weekend! Truffles always make great gifts. I make my own too. Always a hit and a treat. Your truffles look delicious! Hope you had a Happy Easter! Hey, lovely truffles!!! Tried to call you earlier but looks like it's not working anymore. Anyway, hope the move is smooth! Speak soon! Mandy, these are truly spectacular photos! These truffles look incredible. I love Swiss truffles. Have you ever tried Handrolled Swiss chocolate ganache truffles coated with toasted coconut? It is the most unbelievably incredible thing you will ever happen to put in your mouth. Thank you for these wonderful pictures and this post. Yeah! this chocolate truffles is a sweet gift. Wish someone also send me like this. It really looks so yummy. That chocolate truffles sure look really delicious, perfect gift :) the flower photo is nice as well. 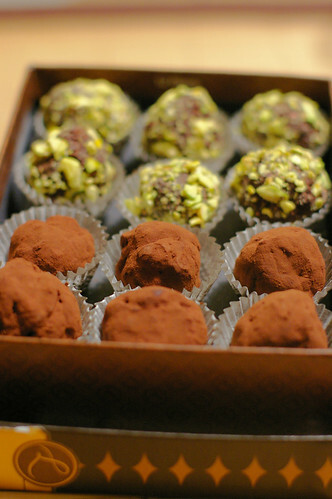 These truffles looks so delicious, a perfect gift not just for Easter but for any occasions.